After you install Transport servers running Exchange Server 2010, you need to finalize the configuration by creating and configuring a postmaster mailbox and performing any other necessary tasks. For Exchange organizations with only Hub Transport servers, you should enable anti-spam features. For Exchange organizations with Edge Transport servers, you need to subscribe the Edge Transport servers to your Exchange organization. For either type of Exchange organization, you might also want to configure journal and transport rules on your Hub Transport servers. Every organization that sends and receives mail should have a postmaster address. This is the e-mail address listed on nondelivery reports and other delivery status notification reports created by Exchange Server. The postmaster address is not set by default. You must manually set the postmaster address. If you want the postmaster address to be able to receive mail, you must either create a mailbox and associate it with the postmaster address or assign the postmaster address as a secondary e-mail address for an existing mailbox. In the Exchange Management Console, expand the Organization Configuration node, and then select the Hub Transport node. In the main pane, select the Global Settings node and then double-click Transport Settings. This displays the Transport Settings Properties dialog box. On the General tab, the current postmaster e-mail address is listed. If you want to change the postmaster address, enter the address you want to use, and then click OK.
Exchange Server 2010 automatically places receive size, send size, and number of recipient limits on messages being routed through an Exchange organization. By default, the maximum message size that can be received by or sent by recipients in the organization is 10,240 KB and messages can have no more than 5,000 recipients. You configure maximum message size limits on individual Receive and Send connectors as discussed previously. In the main pane, select the Global Settings tab and then double-click Transport Settings. This displays the Transport Settings Properties dialog box with the General tab selected by default, as shown in Figure 1. Figure 1. Set transport limits for the Exchange organization. To set a maximum receive size limit, select the Maximum Receive Size check box and then type the desired receive limit in the related text box. The valid input range is 0 to 2,097,151 KB. If you clear the check box or use a value of 0, no limit is imposed on the message size that can be received by recipients in the organization. To set a maximum send size limit, select the Maximum Send Size check box and then type the desired send limit in the related text box. The valid input range is 0 to 2,097,151 KB. If you clear the check box or use a value of 0, no limit is imposed on the message size that can be sent by senders in the organization. To set a maximum number of recipients limit, select the Maximum Number Of Recipients check box and then type the desired limit in the related text box. The valid input range is 0 to 2,147,483,647. If you clear the check box or use a value of 0, no limit is imposed on the number of recipients in a message. Note that Exchange handles an unexpanded distribution group as one recipient. In the Exchange Management Shell, you assign the desired transport limits using the Set-TransportConfig cmdlet, as shown in Example 1. The –MaxReceiveSize and –MaxSendSize parameters set the maximum receive size and maximum send size, respectively. 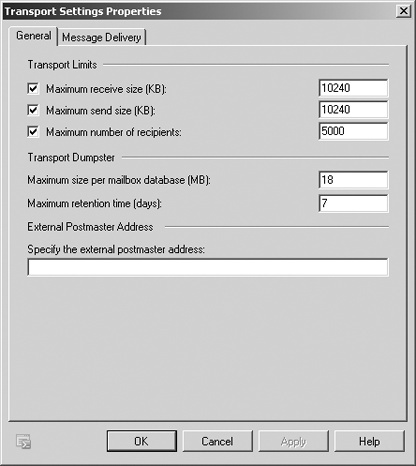 MaxRecipientEnvelopeLimit sets the maximum number of recipients in a message. When you use the –MaxReceiveSize and –MaxSendSize parameters, you must specify the units for values using KB for kilobytes, MB for megabytes, or GB for gigabytes. Your changes are made at the organization level and apply to the entire Exchange Server 2010 organization.